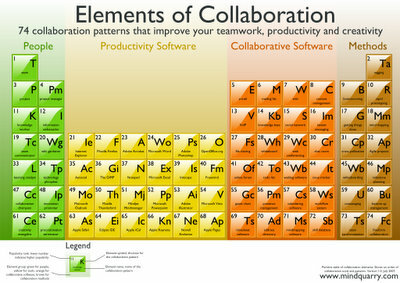 Mindquarry have devised a nice visualization, aka the “Periodic Table of Collaboration” differentiating four categories: People (Roles), Productivity Software, Collaborative Software and Methods. The aim of “Elements of Collaboration” is to give an overview about current collaboration techniques and technology and to show how better collaboration can lead to improved workflows and higher productivity. Wirklich nett gemacht. Das Ganze erinnert mich stark an die “Periodentafel der Visualisierungsmethoden”. Andere Thematik, aber ähnliche Methodik. Interaktive Periodentafeln scheinen ja der Renner der Saison zu sein.